What time are your horseback tours? That depends on availability and schedules. Please see our ride schedule and calendar on the PRICES page. We are open year-round, weather and trail conditions permitting. Also, please note that Triple Creek does not provide tours on Thanksgiving or Christmas Day. How do I make a reservation? On the Prices Page the BOOK NOW button will let you know availability and allow you to book online. For additional questions- email us. How much are your rides? Please see our Prices page. Do you have gift certificates? Yes! It’s much easier to give a horse lover a Triple Creek Horse Outfit gift certificate than it is to gift wrap a pony. Give us a call and we’ll be happy to make the arrangements. What if I want to cancel my reservation with Triple Creek Horse Outfit? Please call us as soon as possible and please read our cancellation policy. What if it’s raining? We do not go out if weather conditions or the trails are hazardous, or if there is extreme heat that could be dangerous to the horses’ health. 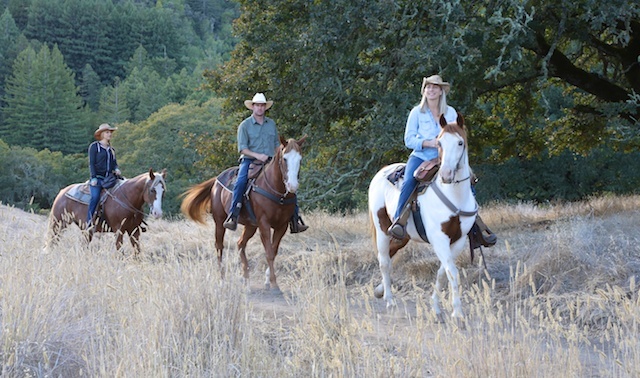 But a light rain can be wonderful on a trail ride—the horses don’t mind and the redwood forest smells amazing in those conditions. I’m in the park today—can you take me for a trail ride? Maybe. Talk to a guide if you see one leading a group of riders or check online booking availability. Can my kids go on a ride? Children 8 years old and up are eligible for trail rides if they are able to follow instructions so they can control their own horse. Riders under the age of 18 must be accompanied by an adult on the ride. Can a child ride on the saddle in front or behind me? No. This is dangerous and will not be permitted. Do you have weight limitations? Yes. To protect our horses we must ask every rider’s height and weight when making a reservation. Right now 210 pounds is our limit, and riders must fit within the BMI index range even if they are lighter than 210. Please be honest; if it is clear that a rider is heavier than the weight we were told when the reservation was made he or she may not be allowed to ride but will still be charged (see our cancellation policy). Please, consult our Body Mass Index chart for the bottom line on who can ride. What should I wear? Riders are more comfortable with long pants, even in hot weather, and are required to wear closed-toe shoes—athletic shoes or sneakers are fine (no sandals or flip-flops). You cannot wear a hat that may fly off your head during the ride; this poses a hazard to you and other riders. Do I have to wear a helmet? Helmets are required for guests under age 18 and are recommended for every rider. You can bring your own or use one of ours. Should I bring my camera? Yes, but you may not want to bring it along on the ride. It’s important to concentrate on riding the horse, and it’s a long way down for dropped equipment to hit the ground. Your guide will be happy to take pictures of you at the beginning and/or end of the ride, and can provide a few small hornbags for people who are willing to risk taking their small cameras on the ride. We do not allow riders to wear backpacks as a general safety measure. I’ve never ridden a horse before—do you deal with first-time riders? Yes! We’ve taken out hundreds of first-timers as well as slightly more experienced riders. If you’re especially nervous or concerned about riding with a group you may want to consider a private ride to get more personalized attention from the guide. I’m an experienced rider and want to move at a brisk pace—is that possible? Maybe. As veteran riders know, horses often respond as a group, so for safety’s sake it’s important everyone go at the same speed—a safe speed for the group’s least-strongest rider. Some experienced riders prefer to book private rides for this reason, so their group will move at the pace of their party’s least-strongest rider. Why do I have to pay a parking fee? Jack London State Historic Park is run by a local nonprofit group that needs funds to keep the park open and in good shape. The $10 per vehicle charge gets access to the museum, many historic buildings and, of course, the best riding trails in the world with Triple Creek Horse Outfit. In addition, Triple Creek customers get a complimentary pass to the Cottage Tour, which they may want to take after their ride. Do you have a special ride for Jack London’s Commemorative Centennial? Yes! Please read all about this limited-time special ride here. Any more questions? Call 707-887-8700!